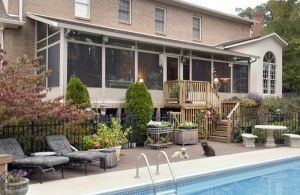 Screen enclosures provide the perfect solution for Manahawkin, New Jersey homeowners who are tired of getting eaten up by mosquitoes every time they try to relax on their patio. Not only do screen enclosures provide protection from insects and other outdoor annoyances, but they also add another spacious living area to your home and are a great place to host parties and gatherings. Studio – Available in 1-wall, 2-wall, and 3-wall configurations, this style is ideal for one- and two-story homes. Low Cathedral – This style offers beautiful vaulted ceilings and a lower back wall height that is perfect for one-story homes. Cathedral style enclosures are also available with glass top and bottom walls. When you choose SRA Home Products to install your screen enclosure in Manahawkin, you will get all the benefits of working with a company that has an A+ rating with gold accreditation from the Better Business Bureau. With over 5,500 projects installed, SR A Home Products has assembled a team of factory-trained and-certified employees you can trust to treat your home as if it were their own. Additionally, all TEMO products we install are covered by a lifetime manufacturer’s warranty, so you can feel good about making this investment in your home. Call SRA Home Products today to learn more about the screen enclosures we install, or to schedule a free at-home consultation for your home in the Manahawkin, NJ area.